A six-time All-Star and former Hart Trophy winner, Eric Lindros goes into Hall of Fame on Nov. 14, but what took so long? Into the Hockey Hall of Fame, after six times being passed over, goes Eric Lindros on Monday. Lindros was selected No. 1 overall 25 years ago, in 1991, and even now he remains one of the most improbable fusions of talent, size and toughness the sport has ever seen. He is 19th all-time in points per game, owns one Hart Trophy and six All-Star nods, with most of his scoring (and all of his honors) coming before his 27th birthday. What took the Hall so long? Surely Lindros had the résumé; Pavel Bure’s and Cam Neely's cut-short careers, as Cup-deprived as his, had put them in. Could it be that lower-body injuries (in puck parlance) sapped the two wingers, while upper-body injuries—concussions, lots of them, including six from 1998 to 2000 (wrecking what should have been the best years of his career)—did in Lindros? Could it be that that the sport couldn’t bear to reckon with what he signified about its not-so-distant past? Every league's Hall of Fame ceremonies aim to trigger the nostalgia at the heart of sports’ sales pitch. We're not talking card shows here: Teams want to be enduring presences in our lives, like family, complete with a similar capacity for draining us emotionally and financially. These inductions are our Thanksgivings. Lindros, though, offers another case entirely. He is happy, active and at peace, living in Toronto, in the Hall’s backyard, raising three young children. He serves as an occasional presence in the Canadian hockey media and plays shinny with other retired pros. He’s not scared of hockey. So why has hockey spent so much time fearing him? Big, bruising center Eric Lindros had a 13-year NHL career that promised huge things before a relentless wave of injuries derailed his considerable talent. His accomplishments -- 372 goals, 865 points, the 1995 Hart and Lester Pearson MVP trophies -- speak of what was, as well was what might have been. Eric was born in London, Ontario, to Carl and Bonnie Lindros, who stage-managed his career to much controversy, the first of which was refusing to let him join the OHL's Sault St. Marie Greyhounds after they drafted him in 1989. 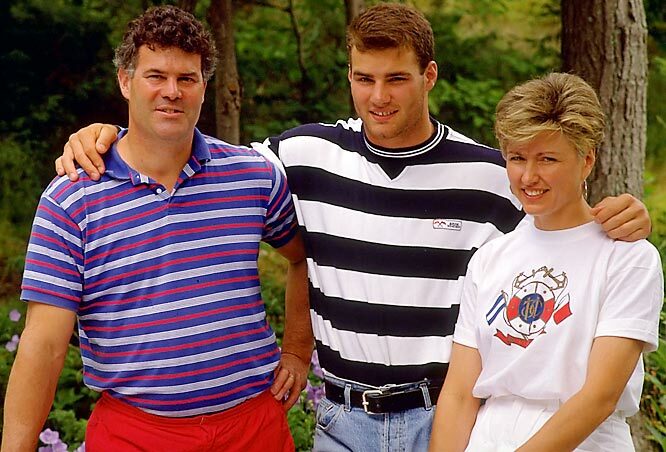 A sensation in Canada by age 15, Lindros led the OHL's Oshawa Generals to the 1990 Memorial Cup and scored 71 goals and 149 points in 57 games for them the following season. Expected to be the NHL's next superstar, hence his billing as The Next One, Lindros was drafted first overall by Quebec in 1991. He refused to play for the struggling Nordiques and, seeking a bigger stage, forced a 1992 blockbuster trade to Philadelphia for Peter Forsberg and five others, plus picks and cash. The 6-4, 235-pound Lindros made an immediate impact with the Flyers, scoring 41 goals and ushering in the age of the power forward. 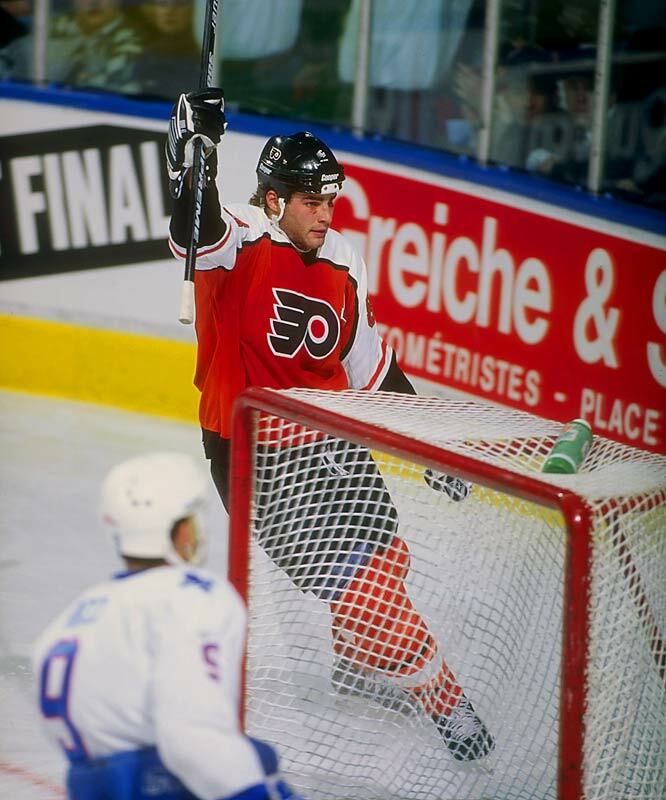 Lindros scored 40 or more goals three times in his first four seasons while skating on the Flyers' potent Legion of Doom Line with wingers John LeClair and Mikael Renberg. During the lockout-abbreviated 1994-95 season Lindros was named the Flyers' captain and shared the NHL scoring lead with 29 goals and 70 points in 46 games, winning Hart and Pearson MVP honors. The next season, at the peak of his powers, he hit his career high of 115 points. 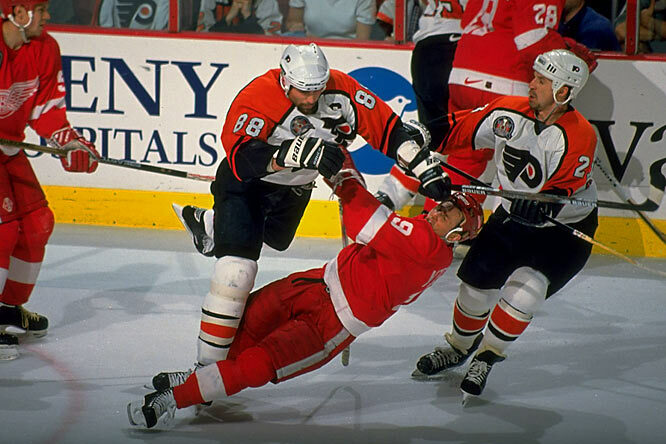 In 1996-97 Lindros powered Philly to the Stanley Cup Finals against Detroit. Though he led the NHL in postseason scoring with 12 goals and 26 points in 19 games, the Flyers could not stave off a sweep by the Red Wings. 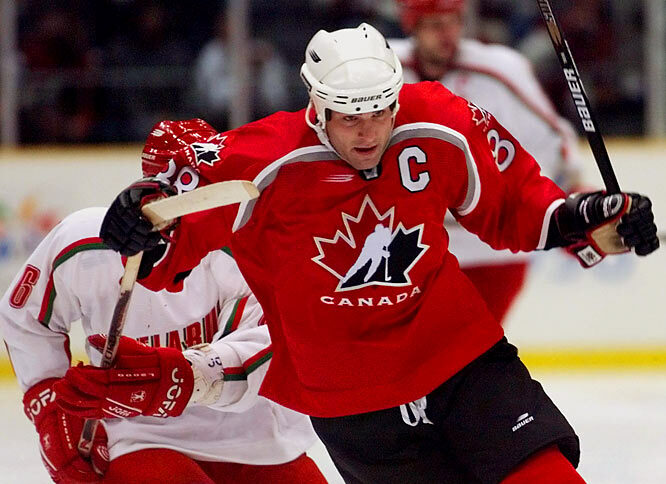 With an impressive international resume that included two World Junior championships, the 1991 Canada Cup title and a 1992 Olympic silver medal, Lindros was named captain of Team Canada for the `98 Winter Games. Alas, he came home empty-handed after losing the bronze medal game to Finland. Injuries began to take their toll in 1996-97 when Lindros missed the first 23 games with a groin injury. Concussions were his biggest nemesis. Especially vulnerable due to his habit of skating with his head down, Lindros suffered eight of them during his career, including six in a span of two years. 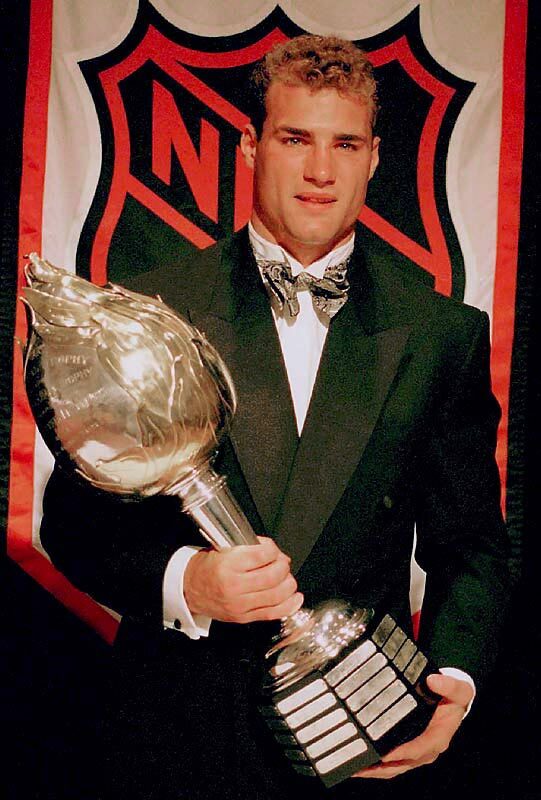 Lindros's younger brother Brett, a first-round draft pick by the New York Islanders in 1994, had his NHL career cut short by concussions in 1996. He was only 20 years old. 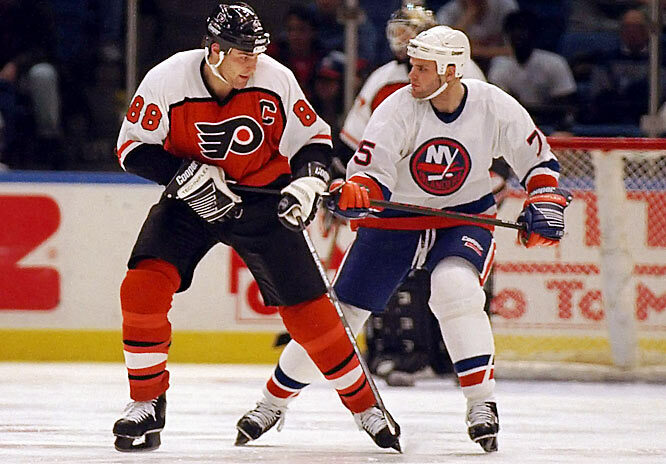 A vicious shoulder to the jaw by Scott Stevens in the 2000 Eastern Conference finals spelled the end of Lindros's eight seasons with the Flyers. He sat out the 2000-01 season while he recuperated, his relationship with Flyers' GM Bob Clarke souring as he questioned the quality of care the team was providing. Clarke flatly refused Lindros's demand to be traded to Toronto. 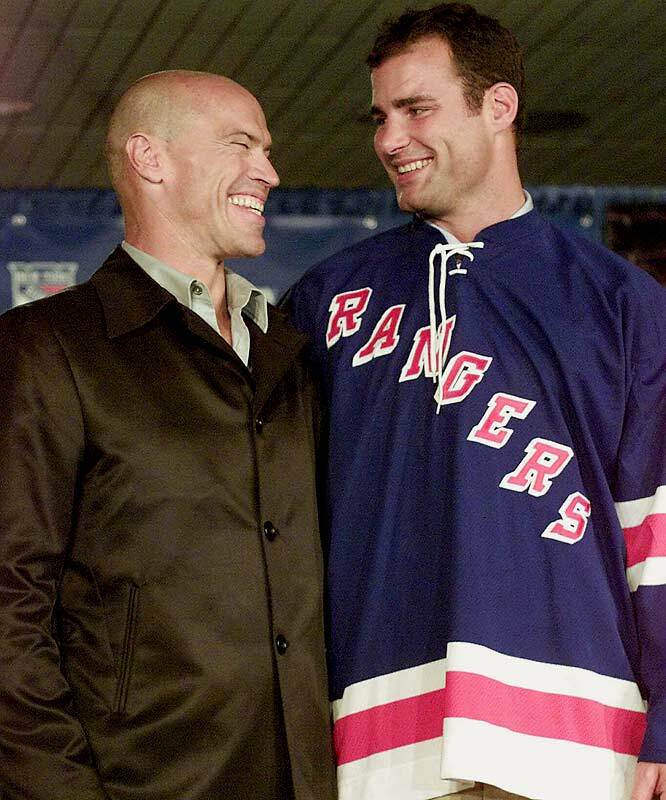 In August 2001, the Flyers finally sent Lindros to the Rangers, where he was united with his boyhood idol, Mark Messier. He scored 37 goals during his first season on Broadway and missed only one game the following season. A shoulder injury and concussion during his third campaign, as well as the team's failure to make the playoffs during his tenure, led the Rangers to decline his option. One of the bright spots of a tough stretch came in 2002 when Lindros won the gold medal while playing for Team Canada at the Winter Olympics in Lake Placid. 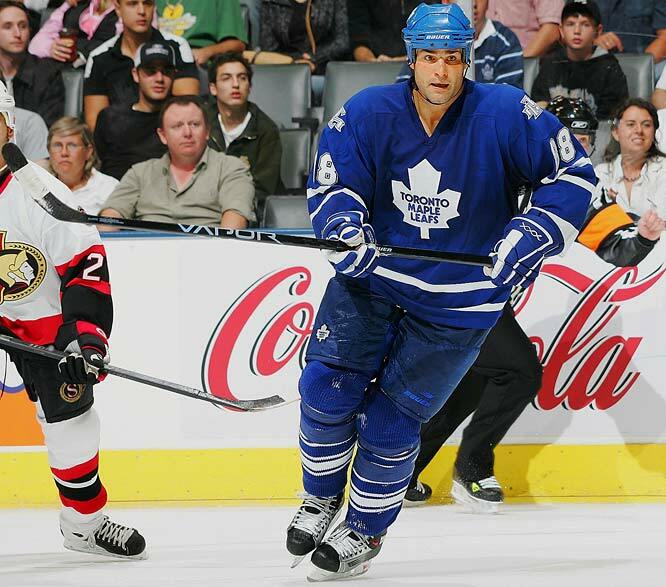 After signing with the Toronto Maple Leafs in August 2005, Lindros was plagued by a wrist injury, scoring 22 points in 32 games. 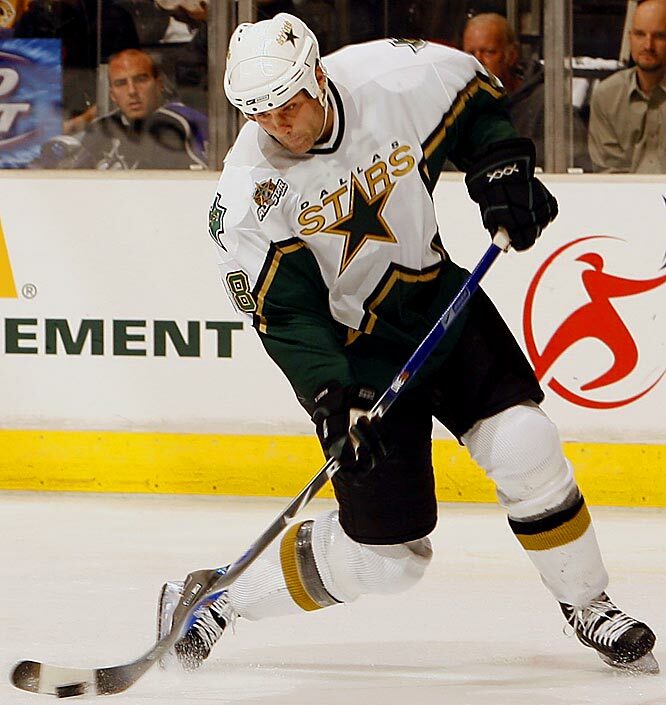 Signed by the Dallas Stars in 2006, Lindros spent his final NHL season battling a groin injury and hoping for a revival of his fading skills. He scored five goals and 26 points in 49 games, making his first, and final, postseason appearance since the Stevens hit. Lindros officially announced his retirement on Nov. 8, 2007 and began a new career with the NHL Players Association, for whom he was appointed ombudsman. He was one of the five players who spearheaded the search committee for a new executive director (Paul Kelly) before stepping down in February 2009. Lindros entered the league on draft night ’91 as its most hyped prospect and its most controversial. His family and his agent had told the hapless Quebec Nordiques, who had the first pick, that he would not sign there. Quebec picked him anyway. When owner Marcel Aubut handed Lindros a Nordiques jersey, Lindros refused to wear it. Resistance like this was no small thing back then, considering the little clout even star players had; owners kept players subjugated, and later that year it would emerge that players’ union boss Alan Eagleson had been stealing from all of them. ​​Lindros sat out the whole season. The story that spread was that his domineering parents had wanted to keep him out of Francophone territory, afraid that it would forever cap his marketability in an age of booming endorsement deals. But in a press conference after being traded to Philadelphia during the 1992 draft, Lindros offered vague, negative commentary on the Nordiques’ owner. “I’m sorry that things couldn’t work out, with the circumstances in Quebec, the way that they were, with the ownership, and basically a lack of winning spirit,” he said. He could have been talking about the fact that financial difficulties would in 1995 force Aubut to sell the team, which became the Colorado Avalanche. Or it could have been something else: In fall 2015, Aubut had to step down as president of the Canadian Olympic Committee after multiple women accused him of sexual harassment. And in an interview with ESPN earlier this year, Lindros made the matter seem personal. 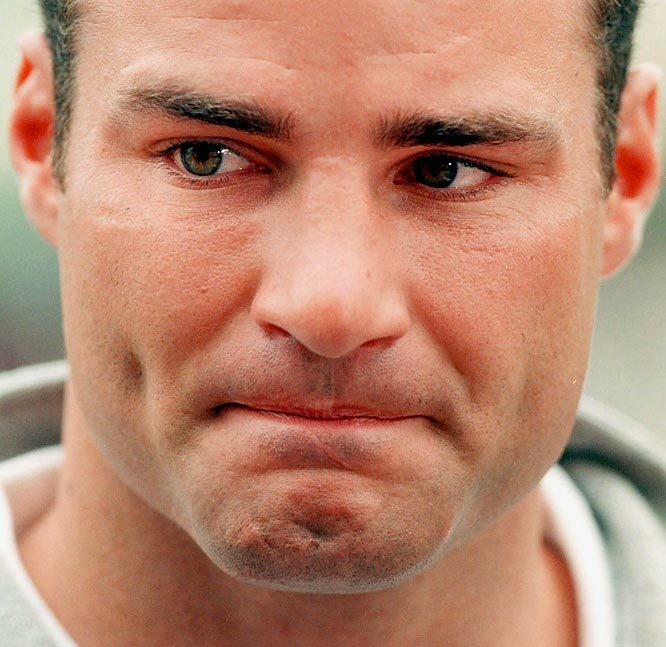 Said Lindros, “The decision to not play for Quebec was based solely on the owner... I was not going to play for that individual—period." 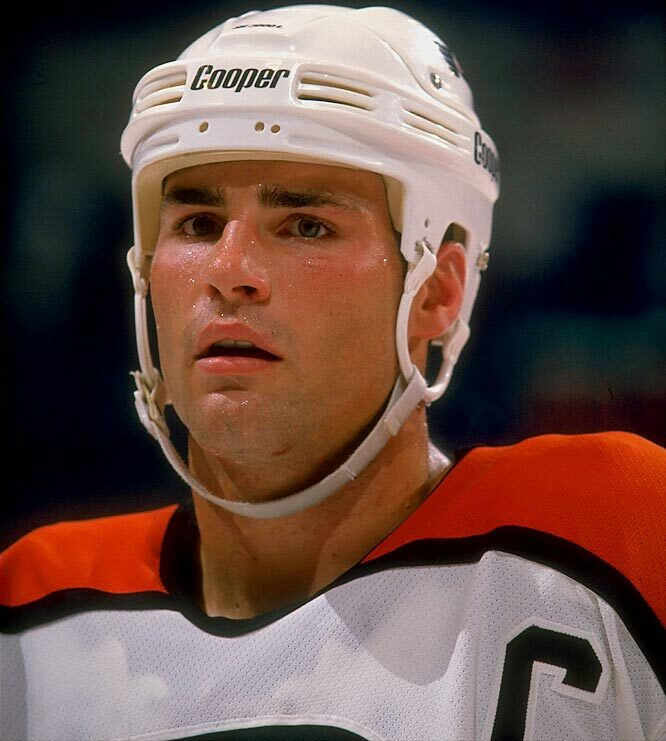 Once in Philadelphia, Lindros earned the Flyers’ captaincy and became the fourth-fastest player to 300 points. In the lockout-shortened 1994-95 season, he won his Hart (70 points in 46 games) and brought Philadelphia back to the playoffs for the first time in six years. The next season his team had the best record in the East. The season after that the Flyers made the Cup Finals, losing just once in each of the first three rounds before a sweep at Detroit’s hands. Lindros led the playoffs in points—he was only 24. And then? March 7, 1998. The Flyers were in Pittsburgh. Lindros had the puck in his skates and was trying to find it as he skated, head down, across the Penguins’ blue line. Darius Kasparaitis, a shut-down defender, popped Lindros in the face with his shoulder. 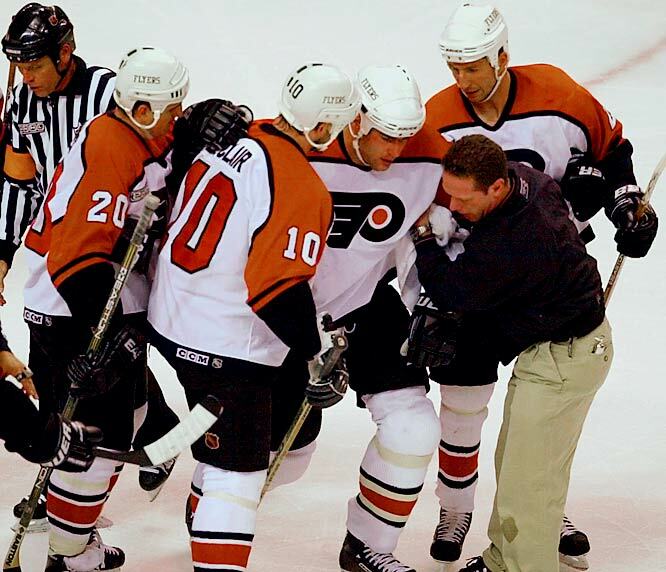 Lindros was instantly stopped; his teammates had to help him off the ice. More concussions would follow, as would other misfortune: After one road game in April 1999, he was diagnosed with a rib injury. Turns out Lindros’s lung was punctured and collapsed, and he had been bleeding internally. The Flyers asked him to fly back to Philadelphia for X-rays; the flight, Lindros’s father told the team owner, could have killed him. Yet the concussions, given everything we know now, posed the graver threat. He had one in January 2000, and sat out four games. Another followed in March of that year—he would play the next four games—after which he sat out and criticized the training staff for misdiagnosing his condition. The Flyers responded by stripping him of his captaincy. He was concussed anew in a scrimmage in May 2000. If Lindros was ill-served by having his father represent him and defend him in the press, he was doomed even more by having to play for general manager Bobby Clarke. Clarke had won two cups in Philadelphia while captaining the revered, violent Broad Street Bullies. Nastier than his play was his personnel management; he once fired coach Roger Neilson after he went on medical leave with multiple myeloma. Clarke would bait Lindros endlessly, calling him a baby and a mama’s boy. In spite of—or because of—Clarke’s goading, Lindros returned from his third concussion that season to appear in Game 6 of the 2000 Eastern Conference Finals against New Jersey. Philly lost, forcing a Game 7. A little less than eight minutes into the decisive game, Lindros rushes over Jersey’s blue line, bearing down on Scott Niedermayer. 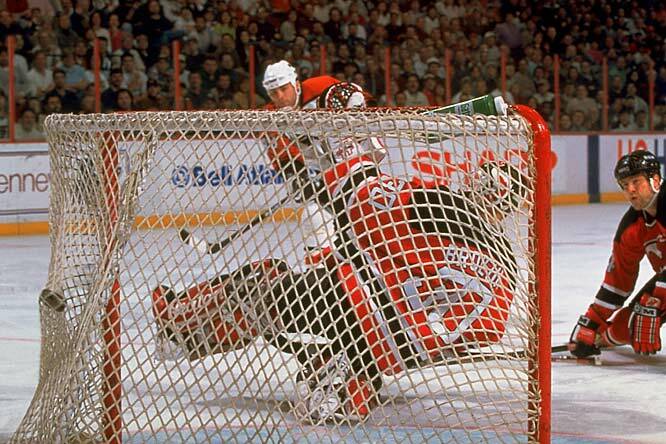 As Lindros works around Niedermayer and puts his head down, Scott Stevens comes from the left. Lindros doesn’t see Stevens’ shoulder as it hits his jaw. Lindros again lays motionless as he hits the ice. Four concussions in fewer than five months. You know what happens after that, don’t you? The Devils win the Cup. Lindros misses all of the next season as he recovers and squabbles with Clarke. Says Clarke, "I'm just so tired of our organization getting beat up so badly by all the accusations the family makes. I don't dislike Eric. I pity him. What's it like to be 27 years old and have your mom and dad running your life?" Lindros holds out and gets traded to the Rangers, wrapping his career with forgettable seasons in New York, Dallas and Toronto. After the lockout, the league changes the rules to favor offensive players. Scott Stevens is inducted into the Hall of Fame. As for Bobby Clarke? He was already in. Clarke and Lindros made amends after he retired, and Clarke, who is on the Hall of Fame selection committee, lobbied this year for Lindros’s overdue induction. His wait was punishment for being the canary in the coal mine. Today, as the league’s player-safety apparatus grows, and players’ autonomy does too, Lindros can think to himself that it was an honor just to have been blacklisted.